CTD profile data are presented from the WOCE A11 cruise Discovery 199 as reported by Saunders et al. (1993). The CTD profiles were taken with a Neil Brown Systems MkIIIb CTD (Deep01) mounted beneath a bottle rosette. The CTD was fitted with a pressure sensor, conductivity cell, platinum resistance thermometer, a SensorMedic dissolved oxygen sensor, a Sea Tech Inc. 100cm path transmissometer s/n 35, a Simrad altimeter model 807-200m and an IOSDL 10 kHz pinger. No fluorometer was attached to the CTD. A total of 91 stations were occupied (12247 - 12337). The 1 second data passed to the Level C were converted to Pstar format and initially calibrated with coefficients from laboratory calibrations followed by a number of calibration corrections. The up cast data were extracted for merging with the bottle firing codes, on time, thus the CTD variables were reconciled with the bottle samples. Final calibrations were applied using the sample bottle data. Finally, down cast data were extracted, sorted on pressure and averaged to 2db values, with any gaps filled by linear interpolation. The CTD data were received as 2db averaged pressure sorted down cast data. Parameters were pressure (dbar), temperature (°C), salinity (psu), and oxygen (µmol/kg). No transmissometer data were received. The data were converted into the BODC internal format (PXF) to allow the use of in-house software tools, notably the graphics editor. The oxygen data were converted from µmol/kg to µmol/l. Spikes in the data were manually flagged 'suspect' by modification of the associated quality control flag. In this way none of the original data values were edited or deleted during quality control. Spikiness was seen in some oxygen profiles at depth and these were flagged suspect. The temperature and salinity profiles for 258-263 exhibited many large instabilities and these have been flagged suspect. For profile 320 the T+S is fairly constant between 80-530db. Saunders, P.M. et al. (1993). RRS Discovery Cruise 199. Institute of Oceanographic Sciences Deacon Laboratory, Cruise Report No. 234, 69pp. 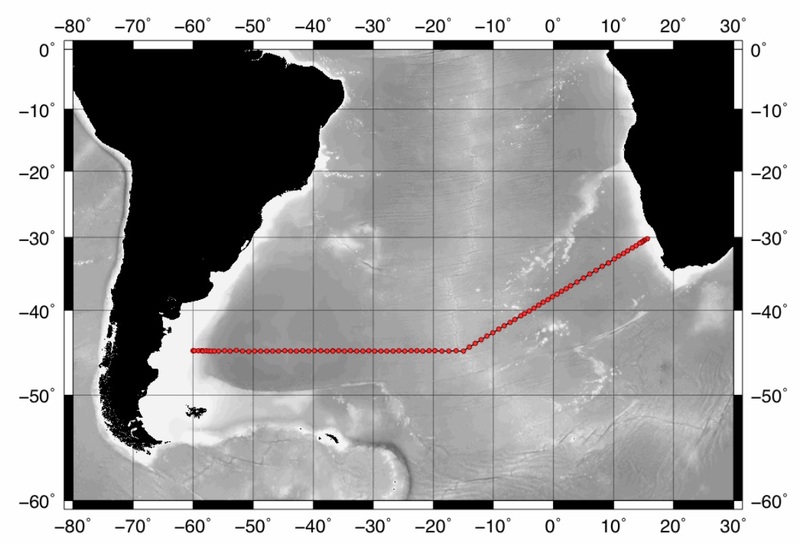 This section is part of the One-Time Survey of World Ocean Circulation Experiment (WOCE) designated A11. A hydrographic section from Chile to South Africa was covered and a full suite of physical, chemical, biological, meteorological and tracer measurements were made. This section was covered by Discovery cruise D199 and took place from 22 December 1992 to 1 February 1993. The map below shows the geographical coverage of section A11.